The following is a brief explanation of how NFQHA figures the percentage of Quarter Horse blood. Our calculations are based on the amount of Thoroughbred blood in a pedigree. The reasoning behind this approach is that TB is the only outside blood that has been allowed to be added to AQHA registered Quarter Horses. Of course, when AQHA was originally founded by Robert Denhardt to preserve the Bulldog Type Quarter Horse, the blood in the founding stock was a mixture of Barb, Thoroughbred, Mustang, Arab, draft horse, and a myriad of other blood. However, the registry was closed to all of these breeds except the Thoroughbred. NFQHA’s philosophy is that if the only added blood is taken out, what remains is the original foundation stock. 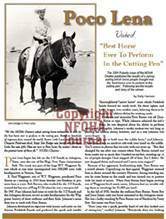 NFQHA also believes that generally the more TB in a horse’s pedigree, the more TB attributes that horse will likely exhibit, and the more Quarter Horse attributes will be lost. A horse must possess 80% Quarter Horse blood. It does not matter what generation the TB ancestors appear in as long as the combined total of TB blood does not exceed the allowable amount. In order to figure the TB percentage, the amount contributed by the first TB ancestor encountered on each line is added together to come up with the total Thoroughbred blood. The horse in this example carries 82.815% Quarter Horse blood (which is rounded up to 83%) and is eligible for NFQHA registration. To establish the TB in a pedigree, NFQHA researches the pedigree back ten generations, or to the parents of the first registered horse, whichever comes first on each line. Each time a TB is encountered, it is added to the total. The only two exceptions to this rule are Joe Reed #3, and Oklahoma Star #6. They were honored with #3 and #6, by AQHA because of their important contribution to the breed as Founding Sires. Because of this, NFQHA does not look at the TB in their parents, and they are considered 100% Quarter Horse blood. This is a huge research project, possible only with sophisticated computers and software, but it was the only fair, comprehensive, black and white method that the NFQHA Board of Advisors could arrive at. We did not want a horse that had Thoroughbreds close up in its pedigree to be considered pure Foundation just because the offspring of those Thoroughbreds might have low AQHA numbers. We hope that this explanation will help in understanding how our research is done. When your horse has been researched, a fact sheet showing all the contributing TB blood, and the position in the pedigree where it was found, will be forwarded to you with your certificate. Copyright ©1998-2011 National Foundation Quarter Horse Association. Get the most accurate Foundation Quarter Horse Percentage. Only NFQHA researches back 11 generations! All of our research is done by computer and based on AQHA downloaded records.